COPS swimmers are pictured with Lucy Arden from sponsors Copleys. From the left are, back, Henry Pearce, Lucy Arden, Richard Leech COPS chairman, Myles Robertson-Young, front, Mia Leech and Emma Leslie. City of Peterborough Swimming Club (COPS) have received somme valuable legal support. Huntingdonshire solicitors Copleys, who have offices based in Huntingdon and St Ives, have helped the club purchase some state of the art backstroke racing ledges. Pictured standing behind the new backstroke starting ledges supplied by Copleys are from the left Myles Robertson-Young, COPS chairman Richard Leech, Lucy Arden from Copleys, Emma Leslie, Mia Leech and Henry Pearce. The latest in backstroke start technology will benefit swimmers at the club and those competing in meets hosted by COPS at the Regional Pool. The ledges are fixed to starting blocks at the start of each backstroke race and are designed to increase power and lift as each swimmer starts. They also greatly reduce the risk of slipping off the start during critical competitions when every second counts. The ledges bring higher reliability for the swimmer and for COPS it means their swimmers will be training and racing on world class equipment from a young age. Chairman of COPS Richard Leech said: “It is great news that funding for swimming nationally has been increased following the Rio Olympics and Team GB’s outstanding medal haul. “However, the stark reality for swimming is that funding is often much much trickier to secure at club level so we have to work hard to secure partnerships elsewhere. 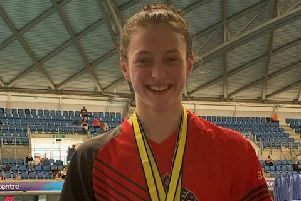 “The COPS team are passionate to ensure our swimmers have access to the very best from coaching through to equipment thus giving them a fighting chance to succeed at the highest level as well as dominating at county and regional levels. This all requires additional funding. “Copleys came to us wanting to help raise the standards for our swimmers and to ensure the swimmers have the best equipment to race and train with. Lucy Arden from Copleys added: “We have been established in Huntingdon and St Ives since 1890 and are now expanding out further across Cambridgeshire. “Part of our core values is to support local communities and in COPS we saw a real tangible chance to make a difference to children who strive for excellence every time they get into the pool whether that be training or racing. All these swimmers live in Huntingdonshire and began with both Huntingdon and St Ives swimming clubs. COPS have a feeder programme which involves working in partnership with the Huntingdon, St Ives, Chatteris, March and Spalding clubs.